Yes, what you read just now is right, ugly fruits won the war after two decades against European Commission. The ugly fruits means the fruit which are not in the perfect/standard shape. *Class 1 cucumbers must be “practically straight” and their maximum bend must be at a gradient of no more than 1/10. 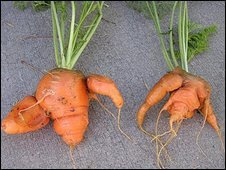 *Carrots must not be forked (with more than one root). They must be smooth and regular. If they are less than 20mm (0.79ins), they must be called “early” carrots. *A bunch of grapes must not weigh more than 1kg. *An onion can only be sold if two thirds is covered in skin. Its very funny isn't it? I don't know what is the problem if a bunch of grapes weigh more than 1kg or carrots are not smooth. 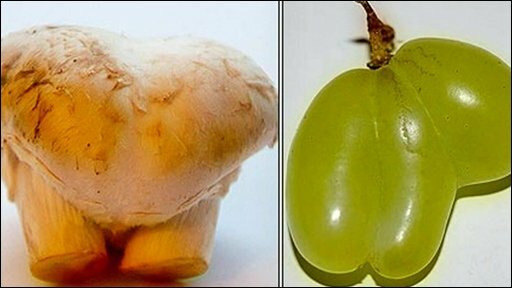 Due to these rules some 20% of vegetables were rejected by the shops because it failed to meet the standard shape. According to new rules standards will be repealed for 26 products : apricots, artichokes, asparagus, aubergines, avocadoes, beans, Brussels sprouts, carrots, cauliflowers, cherries, courgettes, cucumbers, cultivated mushrooms, garlic, hazelnuts in shell, headed cabbage, leeks, melons, onions, peas, plums, ribbed celery, spinach, walnuts in shell, water melons, and witloof/chicory. The interesting thins is that these 10 fruit items accounts for 75% of the value of EU trade. Rule that hasn’t changed: The bend of a banana must be “the thickness of a transverse section of the fruit between the lateral faces and the middle, perpendicular to the longitudinal axis, must be at a minimum of 27mm(1.06ins). Really horror!!! isn't it? Anyway now unattractive vegetables too find a place in supermarkets. Another interesting thing is that retailers estimations says that the price for this unattractive vegetables will be 40% lower. Its not necessary that nature will always give beautiful, size and standard specified by European commission. A banana can be more curvy, but i have no problem in eating that banana, do you have?